Floatation Machines: Star Trace Pvt. 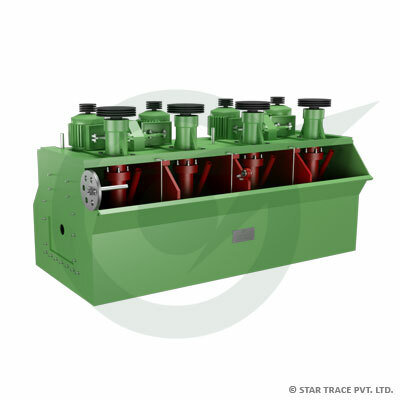 Ltd.
STAR TRACE designs and manufactures all sizes of flotation cells. Multiple impeller/diffuser configuration can be used to either enhance or restrain mixing depending upon the nature of the ore being treated. The robust design allows the structure to be self-supporting and thus fewer supporting beams are requires for installation. Metallurgically the hydrodynamic shape eliminates short-circuiting and prevents sanding. Specially profiled impellers and diffusers enhance efficient pumping of the slurry. Excellent dispersion of the external air feed and homogeneous mixing of the air and slurry all contribute to superior recoveries and grades being obtained. The impellers and diffusers are moulded rubber or polyurethane coated for abrasion resistance.